At Jarrods, we believe that our unique approach to design and installation is a step towards achieving the perfect staircase. In the final part of our ‘Jarrods Approach’ series, we take a look at the installation process and final sign off. Having already confirmed an installation date, we’ll also discuss how we can best prep the area to ensure minimum disruption during the installation process. This is your chance to ask any last minute questions and run over any final details with our team; we’ll be more than happy to help! When we arrive to install your new staircase, we’ll set up a gazebo outside your home so that there’s minimal disruption and mess. We’ll also put dust sheets and floor protectors down as we work to ensure that there’s no mess in your home. We’ll then get the newel posts in place before our professional joiners get to work. It’s a common misconception that installing a new staircase will make your upper floor inaccessible for a certain amount of time. This isn’t the case; you’ll be able to use your stairs throughout the process. Furthermore, the installation process generally only takes a day or two, so we’ll be out of your hair in no time. 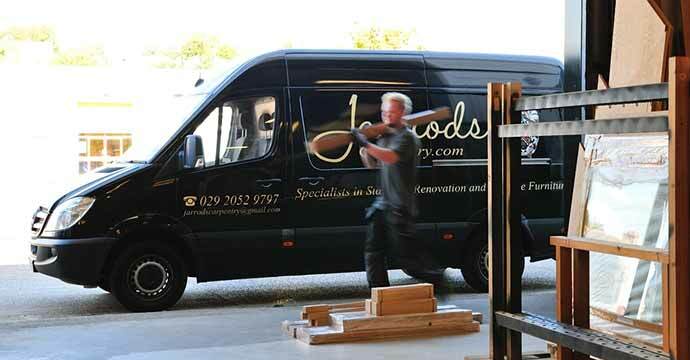 In most cases, we’ll get the staircase fitted and installed within a day without compromising on workmanship or quality; our perfectly-honed Jarrods approach means that we’ve got the process down to a fine art, which means that the whole installation process will run smoothly and efficiently. If you want to pop out for the day whilst we get to work, your home will be in safe and capable hands. Our installation team have even been known to let the dogs out and even bring the washing in. If you’re lucky, you’ll not only come home to a brand new staircase but also the odd household chore completed! When we’re done with the installation, we’ll give your staircase one final polish so that it’s ready for you and the neighbors to admire. We’ll even tidy up after ourselves, and hang your photos back up! Our installation team are both thorough and professional, but they’ll still request that you have a careful look at their work to ensure that you’re completely satisfied. When you’re happy with it all, we’ll ask for the final payment before issuing you with your 10-year guarantee. All that’s left is for you to enjoy your brand new bespoke staircase. That’s it for the Jarrods approach, but if we’ve inspired you to take a step towards your dream staircase, get in touch.